Our team has a challenging UX issue we are trying to solve neatly. We have rebuilt an existing system from scratch and there is a technical constraint that old users will need to re-register to the new system to access their information (there is a shared code between the two systems that will help identify them). To make things more tricky, there was a period of about 6 months where both systems were running, and some clients were on the old system and some were signed up to the new system. Four bands of users have been identified. Users who signed up to the new system after the old one stopped. The trouble is there are two messages we need to get across, one for old system users and one for new system users but our clients are unlikely to know what system they are on. they could have the wrong username / password due to it being an old/invalid account. We don't want users of the new system re-registering unnecessarily and we don't want users of the old system getting trapped trying to reset/retrieve usernames and passwords which don't exist in the new system. We have tried a few solutions, including alerting users to the issue but they barrel straight past the alerts and attempt to login, then get caught up trying to reset a username and password that doesn't exist. We are working on a help wizard to reduce support calls but thought it would be good to get some ideas/perspectives we haven't thought of. Based on your response to my previous answer, since you can not authenticate against the old system but you do have the username data, you can use that as a mechanism to determine which band they fall in. The following flow chart needs more refinement but let me know your initial thoughts. Upon a failed login in the new system, have the same entered credentials checked against the old system's credential database. If it passes, redirect to a pre-filled registration form for the new system. Even if the old system is outside of your control, you may be able to setup a web service that checks if the entered credentials are valid. We sure to flag which accounts from the old user database have been migrated so that you can reject further logins with the obsolete credentials. This is not a challenging problem. Simply add a new link to the log in page of new system. This new link should be labelled "Click here to log in if you used the old system" (or words to that effect). When you click this link you will now be asked for your old login username, and you can now ask other questions which now register the user in the new system, e.g. enter a new password (you might even have new password policies in the new system), and enter any other details you need. Note: you really should have the usernames from the old system, unless you trashed the old system when you shut it down (which would be a dumb thing to do). Once they are now registered, the user never sees that new link again on the logon page, i.e. they just sign in with their username and their new password. This would be a great transition user experience. You can give a compulsory registration screen for the old users on the platform. steps for the old user: 1) Old user comes to your application 2) see a compulsory registration form(as landing page) to go further. 1) old user come to your application 2) if you still have the data of old users. Track them and show them compulsory registration form after entering their old details. with the message "Fill form to complete login" Don't use term registration that might mislead the old users. Not the answer you're looking for? Browse other questions tagged login authentication or ask your own question. 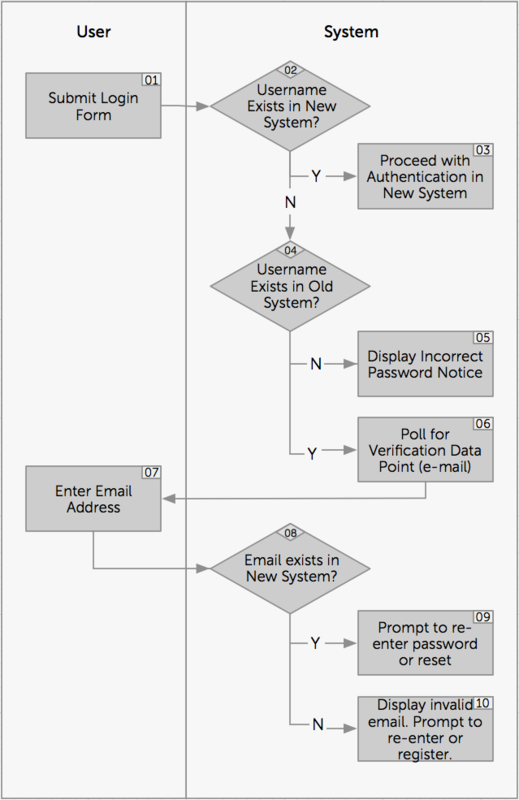 Should (and how should I) I use email addresses for login without validating them?